Also check the no tag folder if you can't find your photos. still uploading, if your folder is empty, check later. #92-100, your photos are still uploading as of 6:44AM, should be another hour or so. Awesome event with SpeedSF as usual. The rain adds a new element in planning for the shot. I end up picking the straight uphill after turn 6 because you are going full throttle up against the rain and has a nice rooster tail. Here's something I tried from farthest to closest panning shot in the rain. Inside corkscrew is another good place to capture the effects of the rain, but, understandably, most people are more cautious and don't drive too close to the berm. All of the photos are here. Almost everybody had a car number, good job! Photos are free with logo, right click save. You can also purchase photos without logo by clicking on the green "buy" button. There are lots of back shots and straight front shots where your car number is difficult to see. If you can't find your photo, look in the "invisible tag" folder. There are still about 8 folders uploading right now, if there's a folder with your number but no photos, it's still uploading, may take a few more hours. Here's a new angle on turn 3 that I have never shot before. Only shot it with Group A this time. 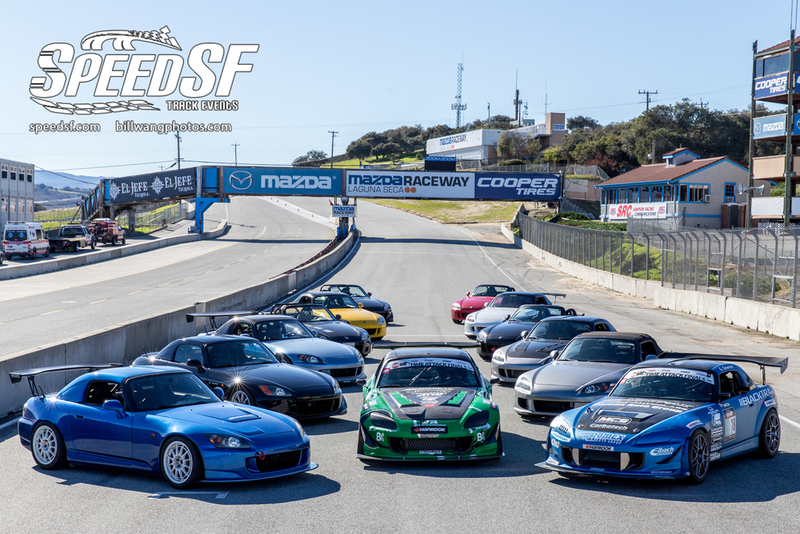 Thanks to SpeedSF and their sponsors for another great event. Haven't been to Thunderhill East for a long time. 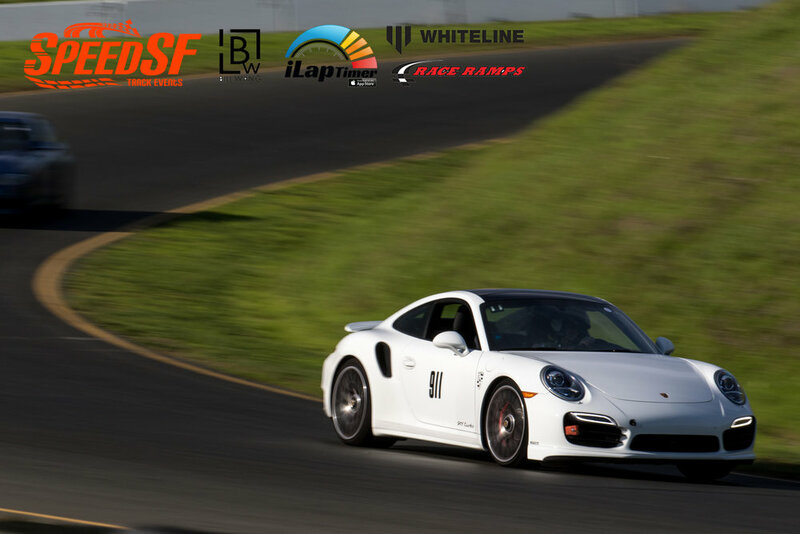 It's great to see more events at Thunderhill East next year! Photos are free with logo, right click save. You can also purchase photos without logo by clicking on the green "buy" button. If you can't find your photo, look in the "no tag" folder. Lots of photos and lots of people show up for this weekend. If you were there both days, Saturday and Sunday photos are shot at different locations. Link is at bottom. I was on vacation in most of October before this event. Still a bit jet lagged, everything still feels a bit foreign as I walked to the first location. That feeling went away quickly as I started shooting. Found a new place to shoot on Sunday. Turn 6 inside, it's great for panning. Probably half of the people got a good panning shot. Not this slanted though, I must be losing balance as I was taking this. You can crop/rotate your photo if you want it like this. Also did panning at turn 2 for experiment. Going up hill. I have shot turn 8 both inside and outside. If you compare the photos, I think shooting from outside makes the track look more intense, showing more S.
There is another good location for turn 8. You can take this without photographer access. It is at the spectator's seat around turn 9, with a long lens (300mm+) you can get something like this. Lastly, a shout out to this guy driving his RV during the parade lap. Look closer, he's even wearing a helmet. Get your photos here. Photos with logo are free to download. Right click save. You can also purchase all photos without logo with gallery download. Let me know if you want to purchase photos for both days. I can send you a discount code. All photos are here, group by car numbers. Photos are free with Logo, right click save. You can also purchase logo free photos from the link. Click on the green buy button. Your car may not be on the gallery cover if multiple cars have the same number. Like folder for "11" has 6 different cars in it. Check "no tag" folder if you can't find your car. Also check it if you only have numbers on the sides. Some front or back shots are not tagged if I can't see your number. Photos are free with Logo. You can also purchase logo free photos from the link. Click on the green buy button. $40 for the whole gallery. And I also have drifters this time! First SpeedSF night event! It was pretty cool, got lots of glowing rotors and a few light trails. All photos are uploaded at link below. Photos are free with logo, just right click save. If you want to purchase full resolution without logo, single photo download is $20. I didn't bother tagging this time, majority of the photos are at night. If you want to purchase than one photo, send me an email with links to all the photos you want. What's better than a glowing rotor? How about two glowing rotors? Thanks for waiting patiently for the photos. I actually had two guest photographer came in to shoot. Standford Kwan was shooting in the morning, and Trevor Ryan was shooting in the afternoon. Setting up the photo folders with multiple watermark is a bit tricky so it took a bit more time. 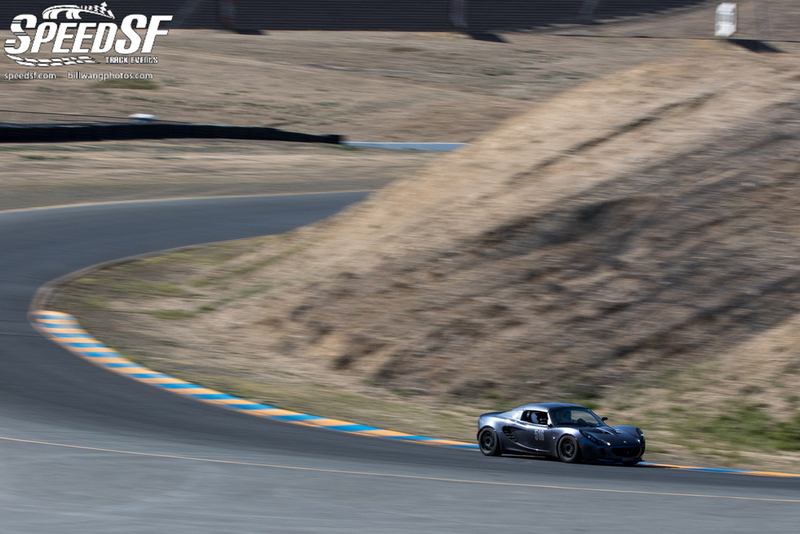 For people who regularly attend SpeedSF events, you're probably have enough my style of photos. So it's great to have a different perspective. The day was really hot. So hot that grass caught on fire for a short moment, and Thunderhill staff quickly put it out. I picked two locations and shot until 2PMish, there's a group of 86's who wanted to do group photos after the event, then Trevor and I also did rolling shots with them for fun. There are two locations where people hops, turn 3 and turn 5. And between me and Trevor we got both. That is how you go fast, or at least look fast. For the 86 group, here's your group photo and some really good rolling shots. 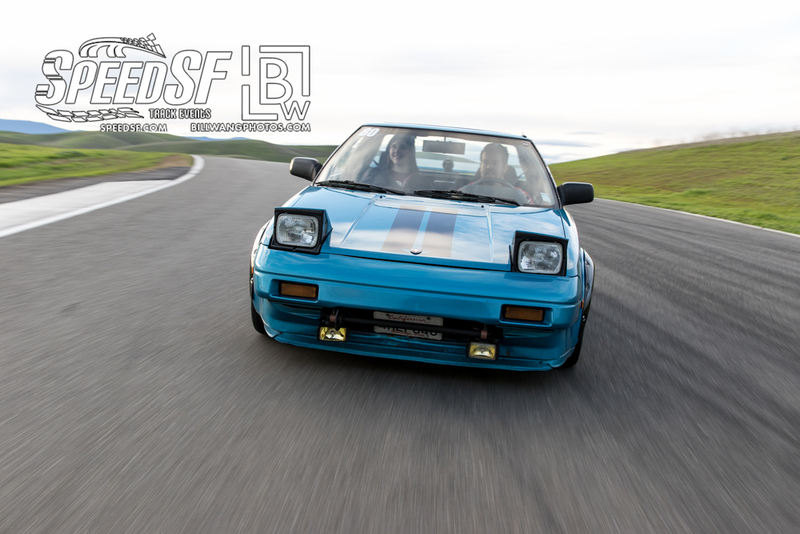 For future SpeedSF events, if you have a group or want to do some rolling shots, let us know. We'll try our best to make it happen. Link to all folders here. Enjoy, be sure to check out Stanford and Trevor's photo folder also. SpeedSF event provides free photo with their logo. If you are posting on social media, please tag #speedsf. Photos without logos are available for purchase, click on the green buy button, you can purchase downloads, prints, and other stuff. Cars with same number are sometimes put in the same folder. If you can't find yourself, check the untagg folder. A real professional, Andrew Bohan, made the shots at this SpeedSF event. I was unable to make it out there on short notice. 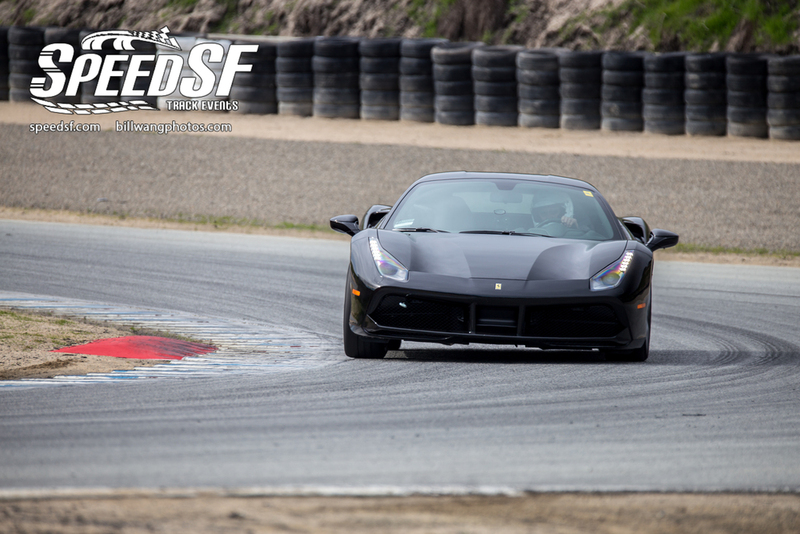 Thanks to SpeedSF staff, they were able to get someone amazing to get you guys photos. Go to Bohan's link to get your photos! I personally also follow his work at Lifeblaster. Met him couple times at Thunderdrift and 25 Hour Thunderhill. Saturday morning was the drop dead date to meet my commitments in my real day job (not photography). Maybe some day I can be a full time photographer and just go to track all the time and tell my wife that I'm really working! Cars with same number will be in the same folder, don't have time to separate them out. Photos with logo are free, just right click save. You can also purchase photos without logo with the buy button your photo gallery. Enjoy. Having track events on Tuesday doesn’t stop people from coming to SpeedSF event! Lots of NSXes this time, I wish I knew ahead of time because it would be a cool group rolling shot. I have shot three sessions for all groups, if you can’t find your photos, check the untag folder. For group D, I’ve only shot at cork screw, the session after lunch. 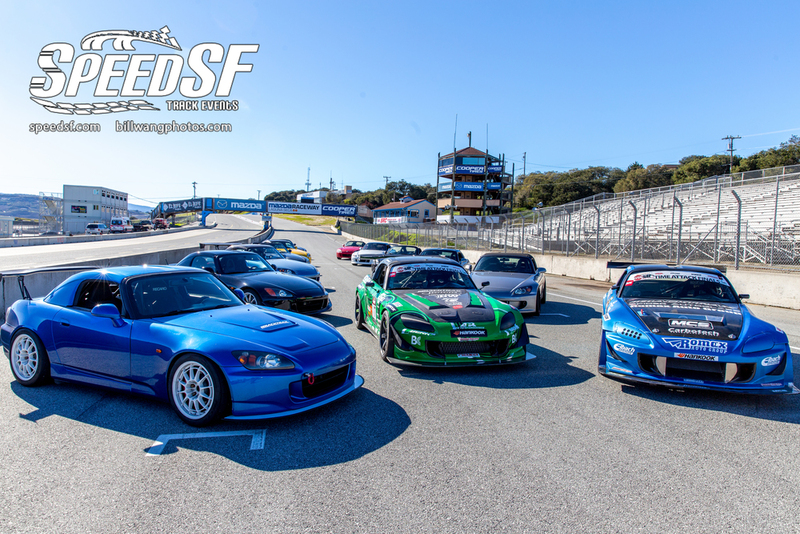 Photos with SpeedSF logo are free for personal use. You can purchase logo free digitals or prints at the link below. Trevor Ryan joined me shooting photos this time, so check him out at this link. He should have photos posted soon after his finals. I first met him last Fall, and have followed his facebook post since. I have been shooting alone, figuring things out on my own for far too long. It’s really nice to have someone to talk to about photo stuff! And besides talking, hopefully you can see something new from the photos below. 4. 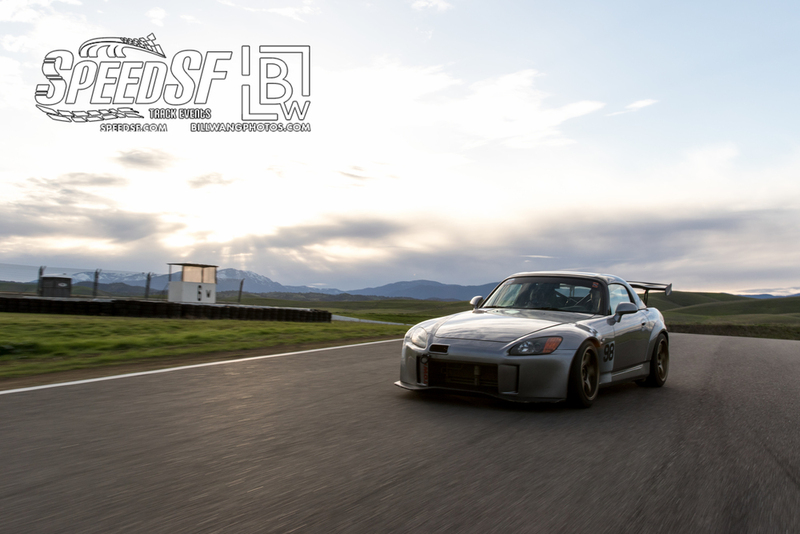 Since there will be multiple SpeedSF logo photos by different photographer, I finally spent the 30 minutes to work with smugmug on a proper resolution watermark. Trevor showed me the technique people use to shoot drifters with very slow shutter. Aim at cars with the hotshot instead of looking through the viewfinder. When shutter opens , viewfinder blacks out. Those half second panning shot won’t work if I can’t keep the car in the same spot. So I played with this for a while and got something usable at 1/6 seconds shutter. Normally, I wouldn’t try anything lower than 1/40. So thanks Trevor, for pushing my limits. I feel I have improved after just working with Trevor for one day. That is really cool, it doesn’t matter what skill level or experience, we can learn from each other and improve. 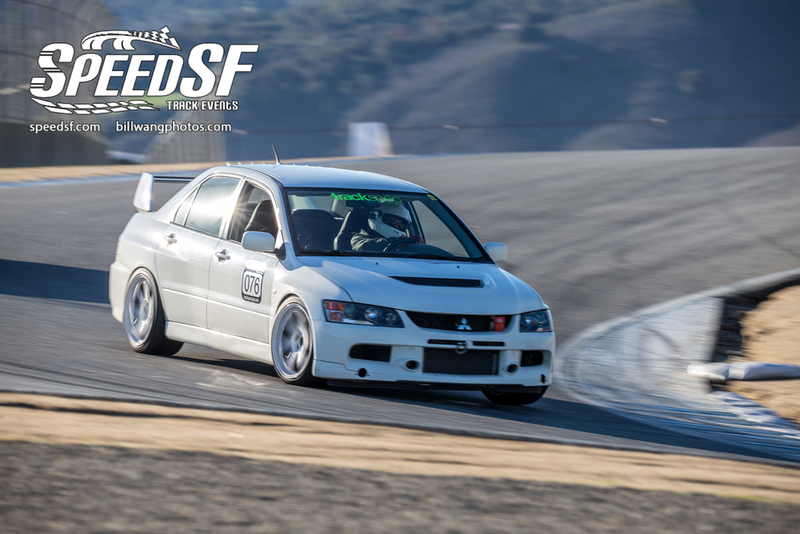 If you are a photographer, hobbyist, enthusiast or a pro, come shoot with me at SpeedSF. I’ll bring media vest next time, you can stay in my garage if you live far. Message/email me. If you want me to do some more edits on your photo, like the ones above, let me know. Don't forget to check out Trevor Ryan's website, he will post his photos later this week. There are probably 20 windows at turn 2. I've spent first couple hours shooting around there to find many different looks there. Even walking up the spectator seats, I find several good spots to shoot. These photos are straight from import, will edit later. Don showed me a picture at the start/finish line. I went all over the stand and couldn't find that specific angle. I've settled at this location and got this shot. After shooting there for two sessions, I realize that Don's photo was actually shot at the flagger's stand, the thing keeps ruining my shots. It was last session for everyone, I decided not to move because I would miss one of the session. Turn 3-4 is actually a good spot to catch people lifting wheels, I saw it couple times before I actually caught a Dan Avon. Also found this spot for back shot. If you want to check out some cool cars, look at number 242, 1, 151, and untag folder. Sorry for the delay, here are the photos. Photos are free with SpeedSF logo. Click on your photo for largest size, right click save-as. Gallery download without logo is $40, single download is $20. Cars with same number will be in same folder, so it may not be your car on the cover. SpeedSF logo photos are free! Right-click save as. No logo single photo download is $20, gallery download (all photos). All prints come without logo. No time to write, heading to Phoenix Internation Raceway tomorrow for IndyCar!!! A full SpeedSF event even on this very rainy day. There were a lot of crazy things happening both with track events and my gears. Long story short, my camera stopped working after the award ceremony. I think I've got some cool shots to make it worth it. Photos are uploading right now, overnight here. Shooting ended pretty early this day due to rain keep hitting the front of my lens. I was wiping it every few shots, the wind was strong. I've got a few good shots of the drifters, will post later. Your photos see link below. This event was extremely exciting for me. First time selling prints on site, found a new window at turn 10 and strapping myself in my wife's Subaru with the liftgate open to do rolling shots! It took a team of people to make this rolling shot happen. So big thanks to Patrick for getting approval from the track, Leo for bringing the coolest car, Soheil for driving, Geoff for coordinating with track staff, Lin for taking podium shots, and Gary for talking Leo into it. The transmission was broken, Leo thought he couldn't do the shot, while I was walking away, Gary yelled "come back", and then I explained we didn't have to drive fast, just go in 2nd gear and drive around 30s. I think this is the best shot, will try again next time for a sharper shot. I've learned a lot in these two laps. Will do a detail write up in my blog. Before the rolling shot, I've also took a long walk from corkscrew. To my suprise, the lock at turn 10 is finally fixed, I could get in and found a new window. Here are some cool shots with in this new area. I will work on getting everybody these shots next time. Lead instructor Andrie Hartanto, hitting apex at turn 3 so hard that wheels are lifted off. I wish the camera was faster to catch it mid flight. Need more FPS! Important note: prices are going up starting next event. Single digital download will be $20, Gallery download will be $40. Adjustments to prints products will also be made. SpeedSF has been very generous in supporting me but I also need to make photography a sustainable business. I want to keep doing this, improving and trying new things which benefits everybody. My stuff are definitely not as expensive as car stuff, but to give you an idea, the fisheye lens for panorama shot at corkscrew cost $1200, the lens for recently new close up at turn 3 cost $2500. Hope you all understand, and I thank you for all the support. Photography stuff will be in blog. It was nice to be back at Thunderhill! It has been over a year since last SpeedSF event held here. Moving up the award ceremony to lunch time is a great idea. From now on, all event pages will be divided section below. And I will not post without writing down my thoughts, because I will never do it after the photo link is posted. Writing down thoughts and experience is important for improving myself and some people actually like reading stuff. These guys drove a lemon! The car cost $500. You can right-click save any photos you see in this link. 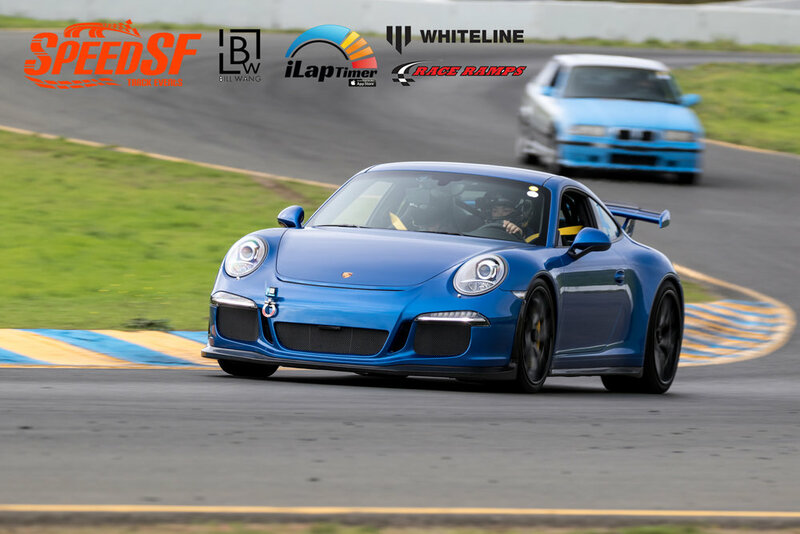 A small SpeedSF logo is on top left on all photos. If you have to crop the photo, please remember to give credits to SpeedSF. If you want photos without any watermark, you can purchase individual download or gallery download. All prints will not have watermark by default. Email me if you like to have watermark on your print. Thinking about getting a large print? Let me know. We don’t spend a lot of time on each photo because there are so many of them. If you’re going to spend money on a large print with any of my photos, I would gladly take another look at your photo and probably do some finer adjustments. I knew the two locations where I needed to shoot for this event, so I went right to it. Turn 11/12 in the morning when it’s still cloudy, and then turn 10. The hardest part about this track is moving around. Unlike Laguna Seca where I can drive myself to all the scenic turns, Thunderhill is mostly walking. Walking in mud after lots of rain is almost impossible. Had my electric unicycle to move around the paved area for the first two locations. I thought about walking to turn 5 but decided to walk around the paddock meet people, look around, and shoot some cars and people. Pretty Fast First Place - Soheil, going off line to give me a wave. Tilt left or tilt right was a question I posted last event. Soheil, said neither, he wants to see the compression of the spring and he can’t see it if the picture is tilted. Thanks Soheil, it does look better for some. If you have any suggestions, let me know! New miata ND, enough compression for you? This car got the Coolest Car award! At the end of the day, when there's only a few cars left, I shot a few slow shutter panning for fun. Skip the reading if you're just here for pictures. Link's at bottom. It is the season of giving, so free 6x4 prints was given away to everybody who stop by our table. All photos digital and print is covered by SpeedSF, just another benefit that you get with running with this awesome group. There's another reason for free print, I was experimenting with numerous photography related things. So if most of your pictures are blurry, I hope you at least walk away with one sharp print. I was shooting with the intent of minimizing the number of photos, one panning shot per car instead of 3-4 shots per car. Shooting with new 150-600mm lens on mono pod. Shooting at turn 3, turn 4 and breaking zone before corkscrew. Not part of my experimenter, but the sun is at least two hours ahead of summer time, forcing me to shoot with a lot of sun. All the cars look whitish from the glare. The new lens made it possible to shoot at those three new locations. I think some of these turn out great. Haven't got the consistency for everyone, but I will work on it. Tilting camera while shooting also helped. This picture is turn 3, a right turn, I still couldn't decide which looks better. Tile left or tilt right? Close up was never part of my routine because I never had the reach. Now that I do have that option, how close is too close? The struggle between difficult dramatic shots (high chance of blurry pictures) vs sharp (but static) pictures is constantly in the back of my mind. I chose to be adventurous this time. From not knowing where to stand, how to shoot, what range to shoot at, it took around 600 shots to get to what I feel is right for this location. Just need to remember, practice and repeat until I can consistently get this shot for everybody next time. Hopefully more people will get better photos next time at this spot. Remember to check the no tag folder if you think you should have more photos. Cars without tag in front or back also goes here even if you have tags on side. All photos are up. Click Here. If you didn't have number on your car, or you only had number on one side of your car, those photos will all be uploaded to an untagged folder.